This is a half day itinerary for the Grand Palace area from Khao San Road. I will give suggestions on things to look out for and common scams to be careful of when visiting the Grand Palace. The guide will include places of interest like Khao San Road, the Grand Palace (and Temple of Emerald Buddha), Tha Chang Market, Wat Pho (or Temple of the Reclining Buddha) and possibly Chinatown if you are daring enough. This guide is based on my visit on June 27, 2012. Feel free to follow my instructions, but take note of the usual disclaimer found here. I will start the trip from Khao San Road, since my main aim is to give suggestion on how to reach the Grand Palace from Khao San Road. Being a popular tourist spot, there are different means to reach Khao San Road but usually taking a cab there will be the easiest. Be careful of the Bangkok traffic though if you start off later in the day. Things there are generally going to be more expensive than say Chatuchak (Weekend Market) or Platinum Shopping Mall (Wholesale prices available). It is actually a pretty short street. If you didn't go there in the day with shopping in mind or at night for the booze and partying, then there's really nothing much for you to do there. Sure, there's local food (which are mostly quite common in Bangkok anyway), massage (I did not check the prices but I don't expect them to be cheaper than most massage palours in other areas). There's even McDonald's, but you didn't go Thailand for fast food right? There's a police station at one end of the street. You wouldn't want to be going there but handy to know help is available in case you need. You will generally be walking along the middle of the road where there's not much shelter, so apply more sunscreen lotion to protect yourself from the Bangkok sun. With that, let's get back to the topic on how to go to the Grand Palace from Khao San Road. This is the first picture that will save me a thousand words, courtesy of Google Maps. 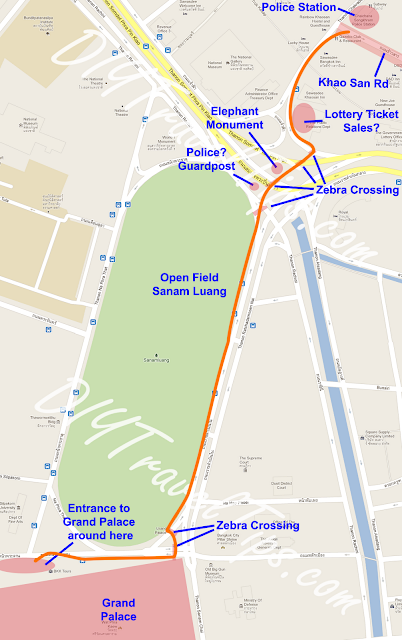 I have mapped out the major areas and landmarks along the orange path from Khao San Road to the Grand Palace. You can also click on it to enlarge. Khao San Road is at the top right corner of the picture. Proceed to the road junction at the end of the street with the police station. It is the last building on the right side and is quite big, you shouldn't miss it. Turn left at the junction and proceed down the path with shop houses on the left, walking away from the police station. Along the way, on the left you should see a place where people are standing along rows of tables with stacks of paper on top. On closer inspection, those look like lottery tickets. Not sure if they are selling lottery tickets? You should come across a zebra crossing a little further up. You will need to cross four sets of zebra crossing. In between, you should see a big stone monument with elephants and a seemingly Police/Security Guardpost. After the last zebra crossing, you will reach a big open field. It is called Sanam Luang in Thai. This is how it looks like. In the distance, you should already see Grand Palace. Walk along the broad pathway all the way till the end. 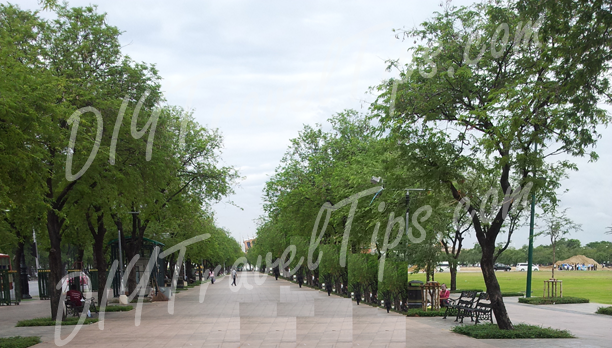 At the end of the pathway, you will need to cross another two sets of zebra crossing and you will be standing outside the Grand Palace. Turn right! The entrance is a little further down the street. Beware of SCAMS! Avoid any touts approaching you and saying that the palace is closed while offering to bring you somewhere else. They are likely going to bring you somewhere and make you pay exorbitant prices. In fact, if you are near the palace, you will hear overhead speakers warning you to be careful of such people and giving information on the opening hours. That's why these touts have moved their operations a little further from the palace where the speaker announcement cannot be heard. I was approached by a tout while walking towards the zebra crossing at the side of the open field (Sanam Luang). The palace is opened daily from 8.30am till 4.30pm but last entry is at 4.00pm. OR you can just rent the necessary attire there. You will know where it is after you pass through the Grand Palace entrance. You will see a small building on the right with people queuing. Just get in the queue, the person at the counter will see what you are lacking and give you a slip to exchange for the necessary clothing nearby. You have to pay a rental fee which is fully refundable but take note to return the clothes BEFORE 4pm or the counter will be closed. When you are finished visiting the Grand Palace, you might want to visit the nearby places of interest like Tha Chang Market and Wat Pho (or Temple of the Reclining Buddha). Below is my second picture showing the general layout of the area, courtesy from Google Maps again. After all the walking, you may want to visit the nearby Tha Chang Market for some food. Exit the Grand Palace from the entrance you came in. Turn left and continue walking down the path. You will come to a road junction and see a market on the opposite side. If you are a fan of the popular Korean variety show "Running Man", then you may know of the episode where the Running Man cast and Nichkhun from Korean boy band 2PM visited Thailand for the first time in 2011. One of the filming spots was Tha Chang Market where the members had to compete in teams to buy for local Thai food. This being a food market, you can find lots of local food. Sweet food particularly seems to be quite abundant here. The Tha Chang Pier is a little further in the market. So you can always come or leave this area by boat. The last boat though seems to be between 6.00 to 7.00pm, so plan your itinerary accordingly. 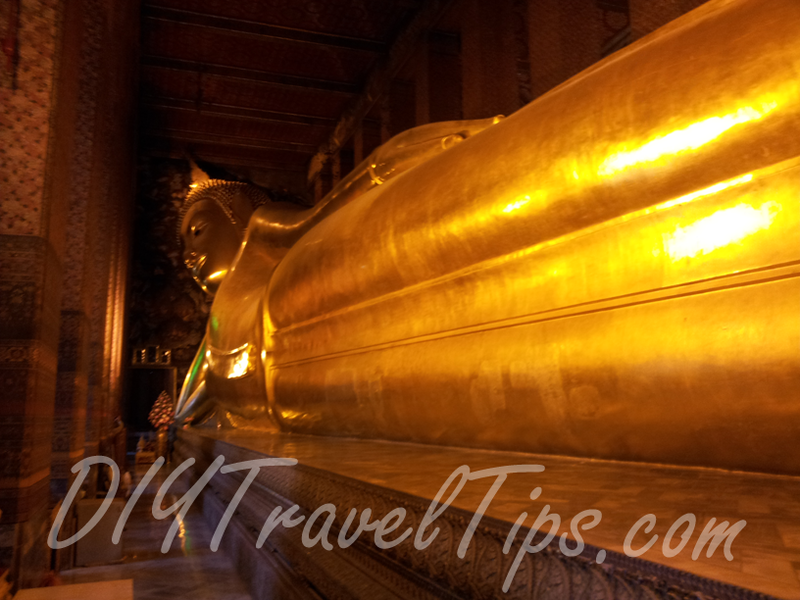 After a quick recharge at Tha Chang Market, go down to the nearby Wat Pho or Temple of the Reclining Buddha, famous for its giant statue of a Buddha lying down. From Tha Chang Market, just continue walking down and you should soon see the temple on the left, which is really just a road across the Grand Palace. Although there's no formal dress code here (as compared to Grand Palace), but do at least try to be respectful in your attire. The temple is opened daily from 8.00am till 6.00pm. The entrance fee is 100 Baht, inclusive of a small bottle of water that can be redeemed in one of the small buildings near the entrance. I heard there is massage available, but I did not see spot any. Maybe I was too late arriving there. By the time you are done, it is probably getting late. For us, we decided to go Chinatown for dinner even though we had totally no idea how to reach there, as it seemed quite nearby on the map. A nice lady told us to take Bus 53 which should be available at any of the stops along the straight road from Tha Chang Market to Wat Pho. It is quite hard to describe where to get off though as the journey was a little further than I had expected. We had to ask a local lady on board where to get off (she spoke only Thai while we spoke only English, just imagine that). 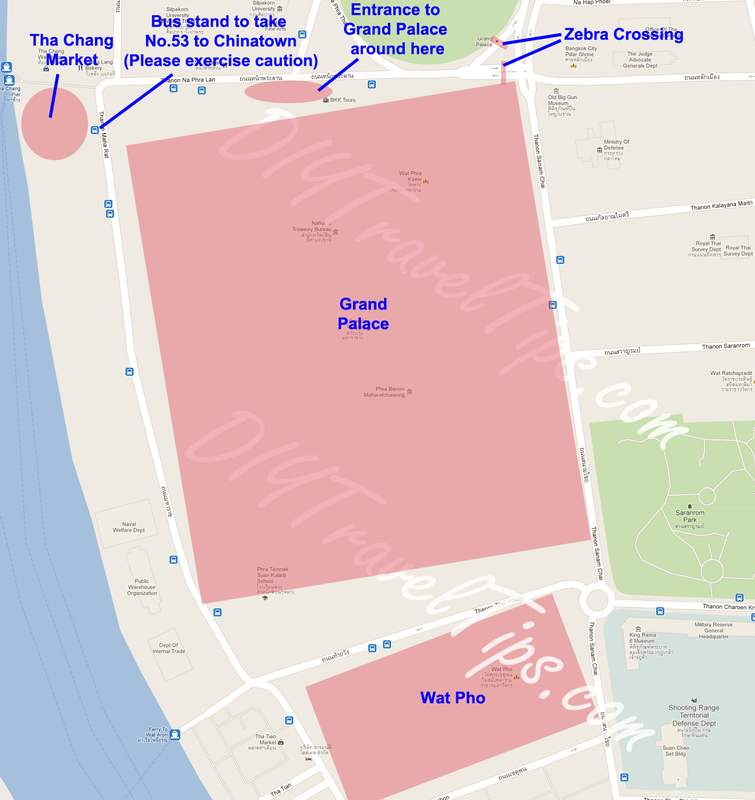 Knowing that Chinatown is at Yaowarat Road helped though, so a try a mix of Chinatown and Yaowarat to get your directions there. Bus 53 also does not stop at Chinatown directly, it was one road away. Best part was the bus stop we got off did not have 53 listed. I also noticed a few other buses not listed which stopped at the stop. The public transport can be quite confusing for visitors. So I really would not recommend going to Chinatown from the Grand Palace area without at least someone reliable to bring you there or at least take a cab (even though the fare might be costly). If you really want to try Bus 53, please read my disclaimer here. 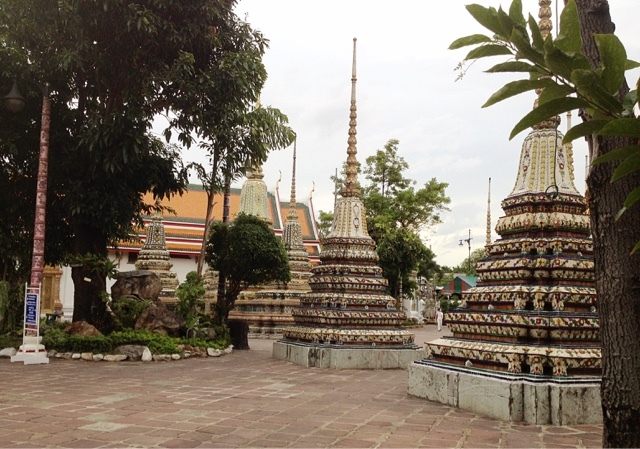 About how long do you think it would take to walk from Wat Pho to Khao San Road? If you are going from Wat Pho to Khao San Road, it would be in the opposite direction to my guide. HI! I find your article useful :) Thanks a lot :) Are there any buses from The Grand palace or even in wat pho returning to khao san rd? or just even up to ratchadamnoen klang rd? Hi, apologies for the late reply. If you don't mind walking, you can use the map I provided above and walk in the opposite direction. The streets should be safe as long you stay on the main road and not wander into smaller alleys. Otherwise, you can try taking a cab, which should not be too expensive since Grand Palace to Khao San Road is too far off. I would not recommend taking bus, because it can be confusing for travelers even during the day, let alone at night.